Raith Rovers are set to announce the return of John McGlynn as manager, the Press can reveal. The 56-year-old, who was at Stark's Park on Sunday for Davie McGurn's testimonial, will be paraded in front of the media tomorrow after agreeing to a second spell in charge of the Kirkcaldy club, where he replaces Barry Smith, who resigned from his post three weeks ago. 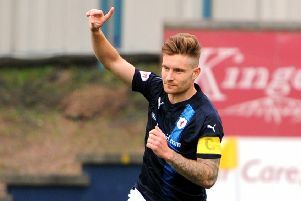 McGlynn, who has been working as a first team scout at Celtic, enjoyed a successful six-year spell in the Stark's Park dug-out between 2006 and 2012, during which time he won the Second Division title before narrowly missing out on promotion to the top flight. He also led Rovers to their first Scottish Cup semi-final in 47 years, losing out to Dundee United at Hampden. He left the club to become manager of Hearts in 2012, having previously spent 10 years at Tynecastle as a coach, but he was axed after just a year in charge following poor league results, despite leading the club to the League Cup final. McGlynn was appointed Livingston manager in September 2013, but after the club hit financial problems, he left by mutual consent in December 2014, again despite leading the club to a cup final, this time the Challenge Cup. He had been a key part of Brendan Rodgers' backroom staff at Celtic but will now return to the dug-out for the first time in four years in the hope of repeating history, and guiding Raith to promotion from League One.